Hanoi (VNA) – Director of the General Department of Vietnam Customs Nguyen Van Can and UK Ambassador to Vietnam Giles Lever have agreed to strengthen the Vietnam-UK customs partnership through the signing of a letter of intent on possibilities of cooperation, heading to a governmental-level deal in the field. The agreement was reached at a meeting of Can and the UK diplomat as well as UK customs representatives in Asia in Hanoi in early May, according to the General Department of Vietnam Customs. The deal is expected to focus on affiliation in facilitating trade, preventing smuggling and illegally transportation of drugs, wine, cigarette, banned goods, wild animals, as well as in developing human resources, providing technical support, and sharing information and experience. The two sides concurred to implement a project to assist Vietnam Customs. Steve Wood, UK customs official for Asia region, said that the project will provide Vietnam with information, experience, human resources training, as well as evaluation on world criminal trends related to land and sea borders, aviation and in Southeast Asia and Asia-Pacific region that relate to Vietnam, while introducing new measures and equipment serving the detection and fight of customs-related crimes. 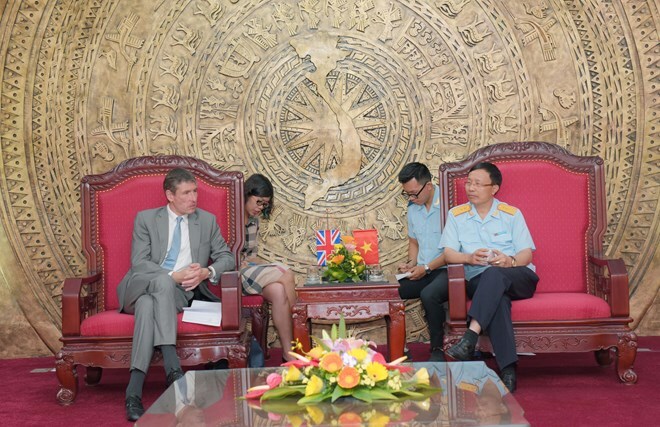 At the meeting, the two sides also discussed preparations for a UK visit of the General Department of Vietnam Customs’ Director in August, during which both sides will officially exchange ideas on the possibility of signing a cooperation deal.